The Norfolk and Norwich University Hospital (NNUH) has received national recognition for a project that has helped reduce disruption for young patients requiring spinal surgery. 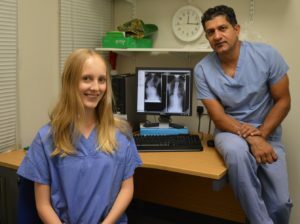 The Getting It Right First Time (GIRFT) programme, which is run in partnership with the Royal National Orthopaedic Hospital NHS Trust and NHS Improvement, has highlighted the hospital as a centre of best practice for coordinating a ‘super scoliosis week’. The Trust was the first in the country to set aside a dedicated five day period just before the start of the 2016 school summer holidays to straighten the spines of eight young patients. The organisation of a dedicated scoliosis week by the surgical and paediatric teams at NNUH has enabled young patients to recover during the school holidays and to be fit again to resume their studies in September. The programme was highlighted in a national spinal services report published by GIRFT last week. Mr Am Rai, who is a Consultant Orthopaedic and Spinal Surgeon at NNUH, added that the project also brought young patients and families together. “The vast majority of children with scoliosis are children who are at school and sometimes they could be off school for a couple of months after surgery, if it happens during term-time. By carrying out the surgery in school holidays, they are off school for less time and the parents do not have to take time off work. This is a team effort and I am very grateful that the paediatric surgery service allows us to do this intensive week. The decision to operate can take as long as six months and we give a series of talks to patients and the families from different specialists. Scoliosis is a condition that causes the spine to twist and curve to the side. It can affect people of any age, but most often starts in children between 10 and 15 years old. Patient Liaison Officer Jo Norton volunteers at NNUH to help children and families affected by scoliosis. Her daughter Daisy had surgery during the hospital’s first scoliosis week in 2016. Jo said: “It was massive for us and Daisy for help and support. Daisy made friends with girls and boys during the week and has kept in touch with a couple of them and it was great to see the progress. Because we had been in the week before and we were so well informed, she was really relaxed about the operation. Daisy’s experience has sparked an interest in a career in medicine and she is currently studying maths, chemistry and biology at Isaac Newton Sixth Form.